There is simply no substitute for the unique reflective ambience of a large, expertly designed live room when recording grand piano, drum kit, acoustic instruments, vocal ensembles, “live-in-the-studio” projects and other situations where natural sound is essential for a high quality recording. 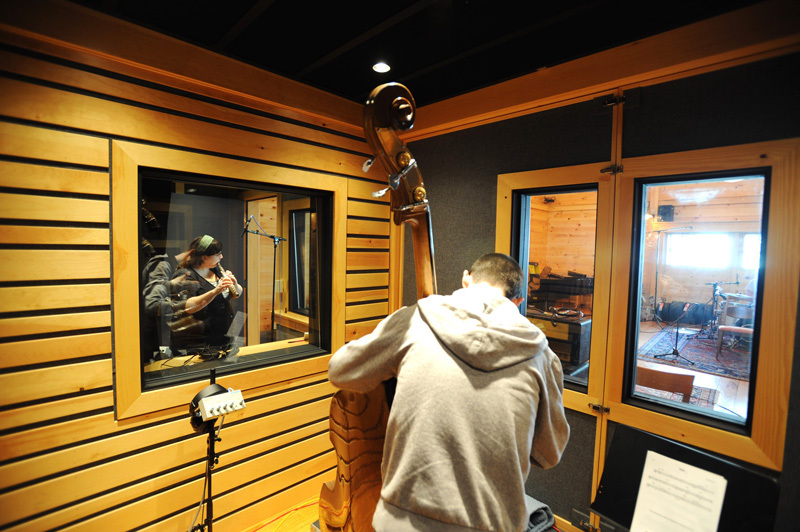 Hearstudios’ 24,000 cubic foot live room is spacious, warm, inviting, comfortable and frankly… it sounds spectacular! Constructed in a rehabbed 19th century grain barn, first the interior walls were torn down to the studs. The entire structure was spray-foamed to increase the building’s rigidity. Thick batt-insulation was installed, along with hundreds of isolation clips, followed by two layers of drywall. 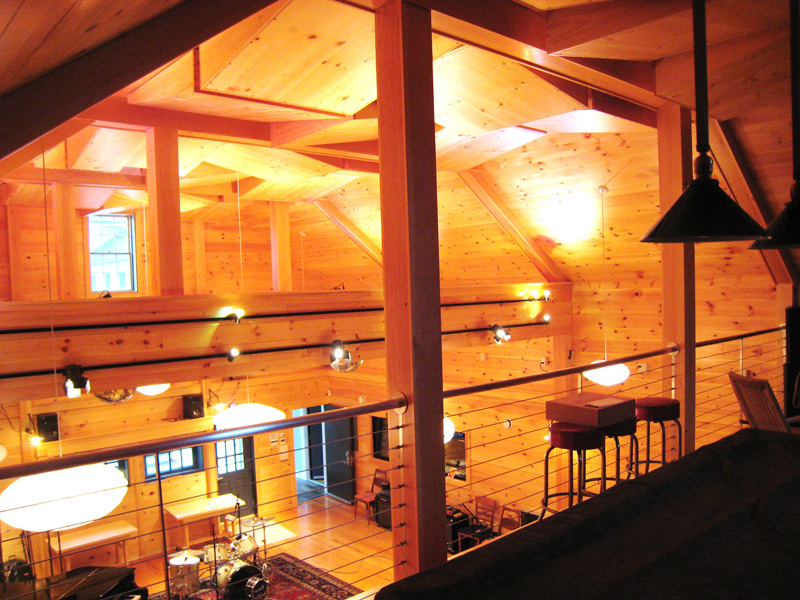 Knotty pine was used as the interior surfaces for both aesthetic and sonic reasons. The natural wood provides a warm, homey look, while the reflective nature of the surfaces creates a variety of sonic textures, depending on mic placements. The acoustics can be further managed by logistical manipulation of a highly unique GoBo system, designed by Jason Hearst and Lou Clark. One fixed iso booth is located farthest from the control room. One large or two smaller additional booths can be constructed “at will,” creating varying degrees of acoustics – a little live, a little dead and very dead with significant trapping. The Gobos can also be implemented within the open live room space. Two extremely insulated re-amp / guitar amp iso boxes in the basement provide complete separation of high volume instruments from the live room or iso rooms on the main floor. The balcony / loft area, back hallway and staircase all offer unique sonic properties for specialized micing applications. One-hundred and four mic lines and multiple Ethernet and line-level connections located on nine strategically placed panels give engineers optimum control over mic, amp, instrument and headphone placement throughout the entire facility. Several large windows on the ground floor provide natural light for daytime sessions, but can be easily sealed from outside sounds by closing the heavily insulated interior shutters. The loft / lounge is also the hospitality area for clients, with basic dining amenities, comfortable seating, and a classic billiards table for relaxation after a long day of sessions. A “silent run” refrigerator is located in the basement, close to the loft staircase. In summary, the Hearstudios live room can effortlessly and efficiently accommodate almost any sized project short of a full scale symphony orchestra.  Total facility area: 30,000+ cubic feet.  Total live room area: 24,000 cubic feet.  RT60 specs: iso booths installed – 1.2 sec / iso booths removed – 0.9 sec / dead area 0.25 sec.  Iso booth 1: 70 sq. ft. fixed construction / deadening surfaces/ glass windows.  Iso booth 2: 90 sq. ft constructed from fixed ceiling / moveable custom GoBos, reflective or deadening surfaces.  Iso booth 3: 90 sq. ft constructed from fixed ceiling / moveable custom GoBos, reflective or deadening surfaces.  Iso booth option: remove iso 1 and 2 separator GoBo to create 200 sq. ft. larger iso space. various sized free-standing rooms with reflective or deadening surfaces. Additional smaller GoBos for added control.  Iso booth features: unobstructed sightlines through windows to all other iso booths and live room.  Re-amp rooms: Two heavily sound isolated (approx. 3’x3” footprint), located in basement.  Mic panels: Nine panel boxes strategically located in all essential areas (live room walls, all iso booths, loft, back hallway, re-amp rooms).  Number of inputs: One-hundred and four mic lines total, two ¼ inch line level connections on each box for re-amping purposes. Cue systems through Ethernet. Remote engineering from any mic panel through Ethernet via portable Avid D-Command.  Lighting: A wide range of natural and custom lighting configurations control mood and visual ambiance.  Environment: Full HVAC control in main rooms and air exchangers in all iso booths.  Load-in access: large dual barn doors, two standard doorways load in directly from driveway, one rear entrance.  Parking: Unlimited, unrestricted, safe parking directly in front of property on Union Street and surround streets.